Both are great. Every mom does it differently. Some stick to a schedule, some stick to a routine, and some do a little of both. 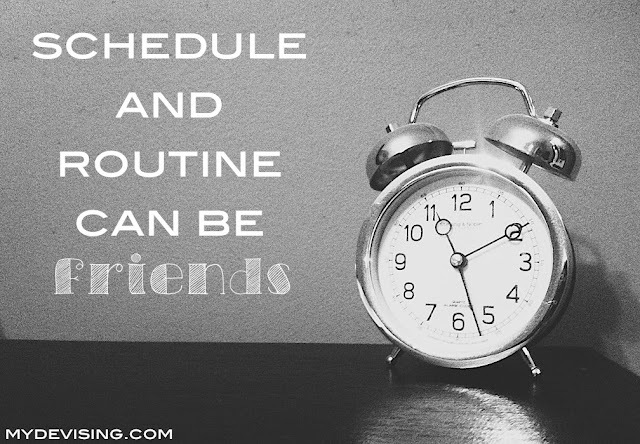 I stick to a schedule but in case that gets messed up, staying with our routine works out just fine. Since we follow Babywise, our routine is eat, wake, sleep. Babywise also encourages getting onto a schedule. A schedule helps so many things. Sometimes when people think of a 'schedule,' they think of feeling boxed in. Actually, I've found that a schedule allows a lot more freedom on my part. If someone wants to meet for coffee, I know exactly when a good time would be. If I was only on a routine, I would maybe have to wait and see until the time got closer to let my friend know when I'd be there. If I had another child who had an afternoon nap at 2pm every day, I could make my baby's schedule to where he would have one of his naps at 2pm also. A schedule also helps you know what's happening with your baby. If your baby keeps waking early from naps, maybe she was over-stimulated during her waketime. If your baby is crying and you know she's rested, full, and clean, she may just have some trapped gas. Because there is order to the day, you are able to see when something is off, wrong, or needs to be adjusted. Can a baby really be on a schedule? Of course! Now, does this mean that if Duke was screaming because he was hungry 30 minutes earlier than usual that I wouldn't feed him? No way! If that happened (and it has), it might just mean he's going through a growth spurt and needs to eat more. Babywise encourages parent direction but also places the responsibility on the parent to follow the cues of your child. Because life is unpredictable, there are times our schedule might have to be compromised. If so, I can always fall back on our routine. That way, Duke still knows what to expect, it just may not be at the same time of day it normally is. Getting off schedule isn't a huge deal. You can always adjust feedings/naps to get right back on. Consistently getting off schedule can be a killer. I quickly learned what things were worth getting off schedule for and what things weren't. Obviously, the holiday season requires a lot of flexibility. We were up for it, but I sure was glad when things got back to normal. Using a schedule and a routine together has worked for me!